This highly entertaining program featured the first cross promotional between KGMB's "Checkers & Pogo" and Ed Francis Wrestling TV shows. The midgets were in Hawaii for two weeks. During that time, midget wrestler Little Beaver appeared on "The Checkers & Pogo Show" as Mr. Checkers' little Indian Helper. On the show, Little Beaver lifted the 300 pound Mr. Checkers above his head. After Little Beaver's appearance, a contest was announced that kids could win tickets to the June 5th wrestling card and watch the wrestling matches with Checkers & Pogo. The card that night had four wrestling matches. 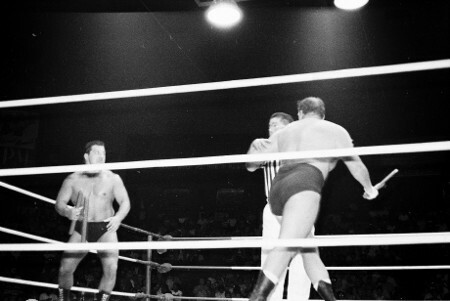 In the first three matches: Peter Maivia pinned Masa Fujiwara, Curtis Iaukea downed the Missing Link, and Jim Hady took two out of three falls from Killer Karl Kox. The main event was a mixed midget 6-man tag team match between Billy White Wolf midget wrestlers Little Beaver and Joey Russell versus Ripper Collins and midgets Sky Low Low and Little Brutus. 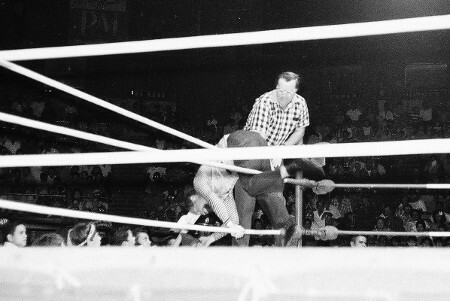 At the start of the Missing Link vs. Curtis Iaukea match, Checkers & Pogo entered the ring and Pogo got tangled up in the ring ropes and had to be loosened by Mr. Checkers. 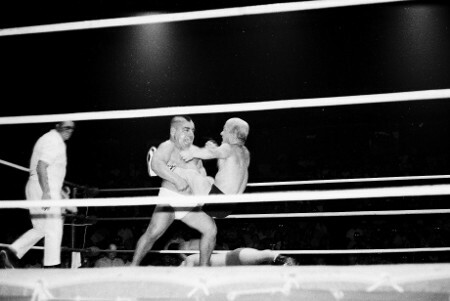 The skit was filmed for KGMB's "Wrestling from the Civic" TV show. Checkers & Pogo enter the ring. The Missing Link applies the Bear Hug on Curtis Iaukea. Hady and Killer Karl Kox confront each other with nunchuck sticks. 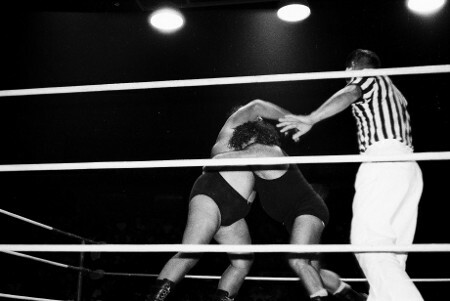 Killer Karl Kox with a wrist lock on Hady. 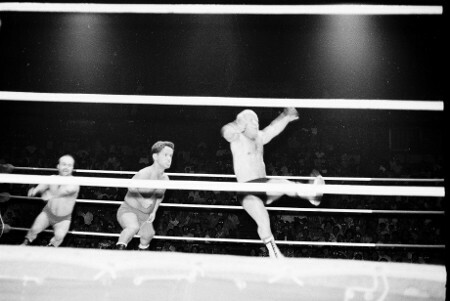 Killer Karl Kox stomps on Jim Hady. 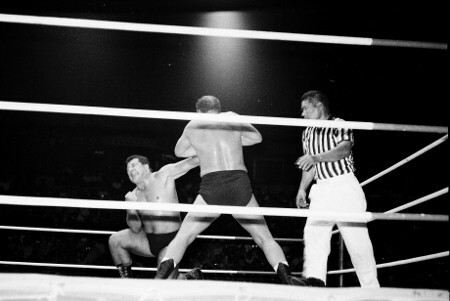 Hady and Kox battle it out in the middle of the ring referee Wally Tsutsumi watches. 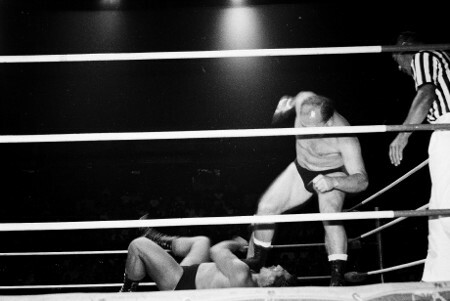 Jim Hady applies the back breaker on Kox. In the locker room interviews leading up to this match, Billy White Wolf told Little Beaver he would "give him $100 if he lifted Collins above his head like he did Mr. Checkers." 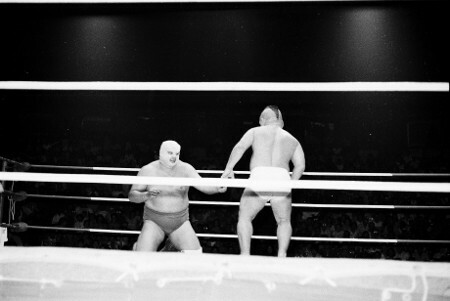 Meanwhile, Collins stated that "if Beaver attempted to lift me above his head and I fall on him, don't blame me if there is nothing but a greasy spot left on the mat. 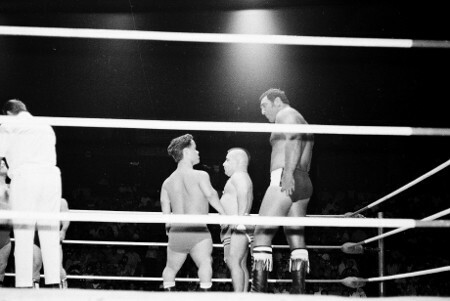 Most of the main event centered around the midgets. Sky Low Low pinned Joey Russell for the first fall, then Russell returned the favor and pinned Sky Low Low for the second fall. For the third fall, Little Beaver pinned Sky Low Low to give his team the victory. Chief Billy White Wolf signs autographs with his tag partners Little Beaver and Joey Russell. Chief Billy White Wolf and his team ready for battle. Little Beaver with a reverse body scissors on Sky Low Low. 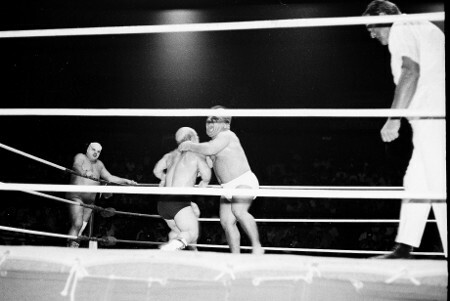 Little Beaver tussles with Sky Low Low as a masked Ripper Collins watches from the corner. Little Brutus, Joey Russell, and Sky Low Low. Ripper Collins dares Little Beaver to square off with him. Ripper Collins sneaks up on Little Beaver. 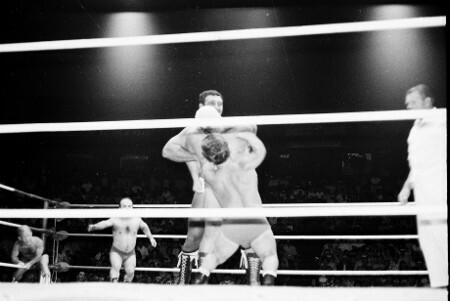 Ripper Collins and White Wolf go at it as Joey Russell pounds Collins from behind. 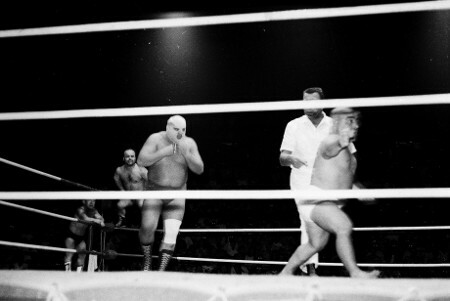 White Wolf watches as Little Beaver and Joey Russell work over Sky Low Low. 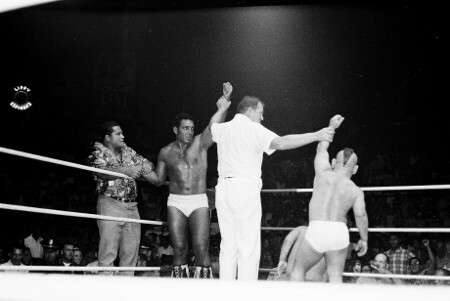 Peter Maivia watches as Referee Pete Peterson declares Chief Billy White Wolf's team the winners.